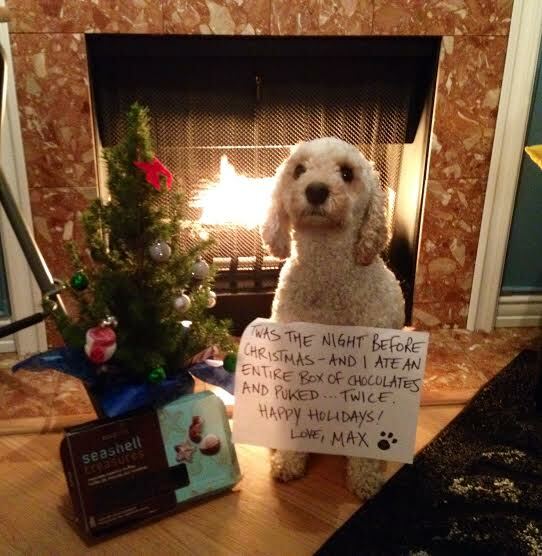 Dogshaming’s downstairs neighbour sent her a picture of naughty dog, Max, who is hellbent on ruining Christmas. Editor’s note: chocolate is very dangerous for dogs to ingest, so if you suspect your pooch got Into your truffles this holiday season, call your vet or poison control! Chocolate doesn’t bother me as much as xylitol. Sugar-free gum is more deadly than chocolate. However, I keep my dog away from both. Glad the dog is ok!!!! He’s cute! Hope he still gets a visit from Santa!!!!! every dog owner should know the hydrogen peroxide trick for making their dog vomit up things like chocolate, or in the case of my little guy a magic eraser. Max’s mom here! Max is fine (after puking several more times through the night) and naughty as ever! Shame on us for leaving the chocolate out – we’re thankful he’s ok and able to enjoy Christmas! 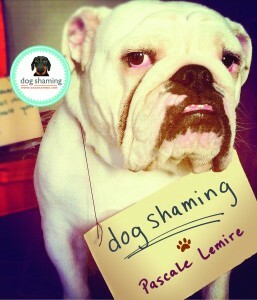 As Max’s adoptive aunt (his mom’s best friend), I can attest to his naughty ways. But he’s the sweetest, cutest, most loving, excited, rambunctious, character-filled little guy. Merry Christmas Max (or Xam as he’s known to his closest friends). I’m glad Max is ok. Look at that adorable face!